Blurb: Very real and gripping. Started looking for escape routes. Review: Hi everyone! It’s River! I just finished one of the ARC’s Enna asked me to read (I’m new to the world of book reviewing, so holding an ARC in my hands made me feel important in a convoluted sort of way and I have to mention it) called “This is Not a Test” and this is my first book review ever, so bear with me. 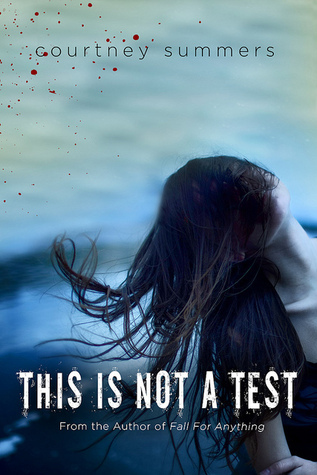 “This is Not a Test” is the story of Sloane, a suicidal high school girl who takes refuge in her high school with five other teens in the aftermath of the zombie apocalypse. Her father was abusive, her sister has abandoned her and now suicide is out of the question for Sloane. She must struggle with her own desire to die, memories of her broken family and the students she is now trapped with. Overall, “This is Not a Test” was an enjoyable read, outside of the smothering “Omigosh, what if this actually happened” panic I feel every time I read zombie apocalypse books like this (I actually started looking for escape routes from my apartment). The book was so real to me; the characters acted like the panicked high schoolers they were—and for the most part, nothing was over the top; it was easy for me to imagine myself there in the high school auditorium with them, trying to sleep on gymnastics mats while zombies flail against the doors. The book has a certain quality that keeps you from getting restless or bored with the story, because even though the vast majority takes place in one setting, I didn’t get tired of it; the characters and story moved at the perfect pace. What’s more, the story revolved around just more than the zombies outside; it dealt with raw emotion and human nature, and made me wonder what I would be like if I was forced into a situation where I had to survive just for the sake surviving. On the downside, I never found myself super involved with the majority of the characters so when the author tried a killing spree along the lines of “I will kill everyone you ever loved”, I calmly turned the page and continued on. The ending was rushed (however, I assume most things are going to be rushed when zombies are after you) but there were some unexpected things that happened that were refreshing to me. Overall, it ended in the perfect spot. If you like the TV series “The Walking Dead”, this is the realistic and more feminine book version. Note: This book is for more mature readers due to heavy use of profanity and sexual scenes. River is a guest reviewer on Squeaky Books. Follow her on twitter! Your right! I should probably start calling her a "regular" guest reviewer, eh? Excellent review! We really enjoyed this book, and we agree with many of your observations. Don't know if y'all have seen it, but we like to think of this book as "The Breakfast Club" (movie) meets zombies. As you said, it goes beyond the apocalypse plot and delves into human nature and relationships. Great first review!! I like how I can easily tell you apart from Enna's posts. You made me a laugh a couple times.